Caer Ibormeith, Celtic Goddess of Dreams and Prophecy, is a pan-Celtic goddess who was worshipped in Ireland, Scotland and Wales. In Scotland and Wales Her name was used to name places such as Caer Edin (Edinburgh). In Ireland Her name identified the homes of Goddesses and Gods, such as Caer Arianrhod, home to the Goddess Arianrhod. Caer Ibormeith was the daughter of one of the Tuatha de Danann, Ethal Anbuail. Scholars believe that over time these original Goddesses and Gods from the pre-Celtic days morphed into faery kings, queens and heros who retreated to underground mounds called sidhes. Caer and her father lived in Sidhe Uamuin in Connacht. Caer (pronounced Keer) was known by other poetic names such as “Shapely Yew Berry” and “Yew Berry”. She was a shapeshifting goddess who spent one year as a beautiful woman and then the next year as a swan. Caer, accompanied by 150 swans, underwent this transformation every year on Samhain, a liminal time when the veil between the seen and the unseen worlds is thinnest. 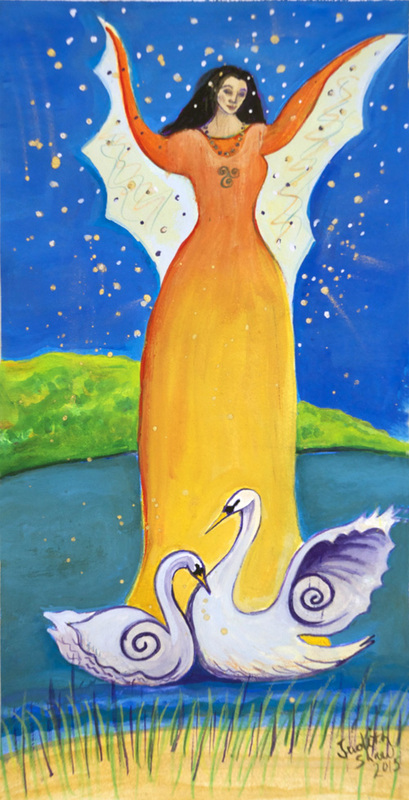 Swans appear frequently in Celtic mythology, often connected with a goddess. They are associated with love, purity, the soul, and music. Swans linked with a goddess can always be recognized as they appear with a gold or silver chain hanging around their necks. Swans, associated with the Festival of Samhain, act as guides to the Otherworld. Caer Ibormeith was a powerful goddess who made Her own way in the world. She chose her man by appearing to him in his dreams. The man she chose was Aengus Óg, son of the Goddess Bóann of Newgrange (Brugh na Bóinne) and The Dagdha, father of the Tuatha de Danann. The tale of that union is another story for another day. As Aengus, God of Love, Youth and Poetic Inspiration, lay sleeping one night he was visited by a beautiful young woman. She seemed so real and he reached for her but she disappeared when he woke. He was smitten and knew not what to do. He told no one of his experience. Every night for a year, while Aengus dreamt, she visited him and played sweet music on Her timpan. Aengus, having lost his appetite on the first night of this experience, fell ill. He wanted nothing more than to sleep his life away with his love by his side in the dreamworld. Finally a physician was called. He quickly understood the source of Aengus’ illness. He solicited help from Bóann, Aengus’s mother, to find the young woman of his dreams. She searched for a year but to no avail. Then his father, the Dagdha was called on for help. Aengus had now been afflicted for two years when the Dagdha solicited the help of Bodb, king of the Sídhe of Munster to find her. He took yet another year to search and ultimately find Caer. Now the help of Medb and Aillil was sought as Caer’s sidhe was in their territory, Connaught. They found her father, Ethal Anbuail, and demanded her hand in marriage for Aengus. But he replied that he could not comply as Caer’s power was much greater than his. “I cannot force her into anything.” he said. “She rules Her own life.” That is when he explained the shapeshifting between woman and swan that took place every Samhain. Ethal Anbuail then spelled out Aengus’ only hope. He was to go to the lake, Loch Bél Dracon, on the following Samhain, recognize Caer among Her swan companions and call to Her. Only then might She come to him of Her own free will. And so Aengus went. He found Her there with 150 swans all with silver chains around their necks. Aengus despaired, not sure if he could find Her among all the swans. But then he saw one swan with a silver and a gold chain who shined even more brightly than the others swimming toward him. He called to Her She must have wondered why he took so long to answer the call of his dreams. She replied that She would come to him if he promised that She could return to the water. He agreed, turning into a swan himself for how else could he be with Her in the water. Caer and Aengus embraced and returned to the lake, swimming around it three times. Then they flew away to Newgrange, Aengus’ home, singing a song of transcendent beauty. There they became human again and lived together with great love and joy. The song of their love cast an enchanted sleep of three days and three nights onto all those nearby. Even today there are those who claim to hear this love song every year on Samhain Eve. Call on Caer when you need guidance from the dreamworld. With Her help, open to receiving prophetic dreams. Let Caer’s otherworldly music work its magic on you to create more loving relationships in your life. Judith Shaw, a graduate of the San Francisco Art Institute, has been interested in myth, culture and mystical studies all her life. Not long after graduating from SFAI, while living in Greece, Judith began exploring the Goddess in her artwork. She continues to be inspired by the Divine Feminine in all of Her manifestations. Originally from New Orleans, Judith now makes her home in New Mexico where she paints and teaches part-time. Her work, which expresses her belief in the interconnectedness of all life, can be seen on her website. Great post! The information on the swan was very interesting – I just had one appear in a painting I am doing and I had no idea why it had…now I do…thank you. Gorgeous work! Thank you so much, Judith, for Caer Ibormeith, and for awakening our hearts to the great mystic Celt goddesses. This story seems to have inspired many later writers. There are overtones of the ballet “Swan Lake”. Yes swans are found many places in Celtic mythology and literature. They are such beautiful birds and so majestic. I think one of my favorites is the story of Lyrr’s children whose sons were turned into swans by the ever present evil stepmother. Their sister then had a hero’s journey of many many years to rescue them. Jassy don’t you love the way things appear in paintings without us consciously intending it. They mystery of painting….. Such a lovely story! Thank you for sharing her with us! I am so enjoying all your Celtic Goddess stories, Judith! Being a Celtic witch of Scottish descent these stories speak to me on many levels. Thank you. I too have had that strange experience of something appearing in a painting. A very interesting way to receive a sign. Fascinating! 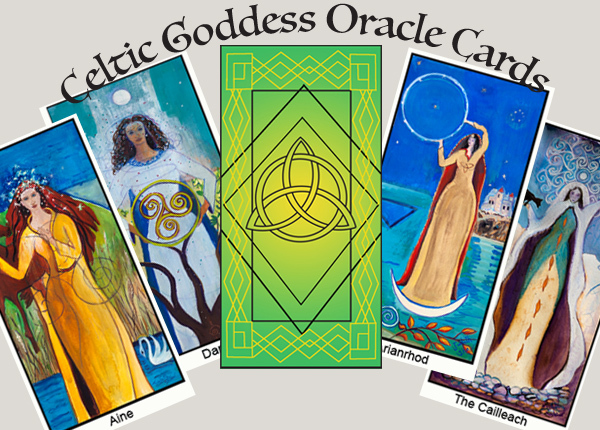 Treetalker, I also have Scottish, Irish, French and British ancestors and am really enjoying learning about my Celtic heritage as I explore these goddesses. It’s funny how Greek and Egyptian goddesses are sort of known about but Celtic not so much. At first it was so confusing with all the varieties of stories and the names and the multiple appearance of some in various stories but now I’m starting to remember and recognize the names. For instance Aengus in this story is the same one who gave Etain a sanctuary for a few years when she was being buffeted about as a butterfly. Thanks for reading. Judith thank you for sharing this wonderful story, and for your lovely painting! Here’s my latest Celtic Goddess painting and story, published today on the Feminism and Religion blog. I’m so glad that I decided to read your post after returning from vacation. I love the myth you recount. And I love the idea of swans as psychopomps at Samhain, since tundra swans return to Lake Mendota (in front of my house) around Samhain!! I’ve always loved them. They make the eeriest, wildest sound. Now I understand how listening to it transports me to another space entirely; they’ve guided me to the Otherworld. Thanks!! Nancy, Thanks for sharing your experience with swans. Isn’t it amazing how the ancient stories and myths have so many elements which ring true for us today.